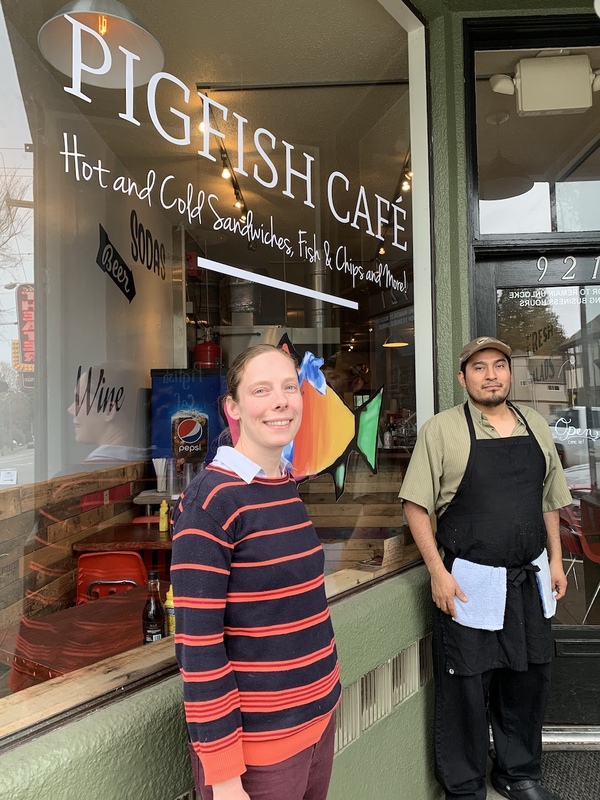 Victoria Loce, and Mario Reyes are the owners of the new PigFish Cafe at 921 152 Street SW in Olde Town Burien. Their grand opening is set for April 26 at 4pm. The Pigfish Cafe now open in Olde Burien at 921 SW 152nd may have a funny name but the food and meaning behind the name are wonderful. Owned and run by Victoria Love and Mario Reyes the new cafe is named for their two children ages 2 and 5 whom they nicknamed "Fish" and "Puerco" (which means 'little pig' in Spanish) hence PigFish. Mario, who is a highly experienced chef and who has worked in various different Seattle restaurants as a chef realized that Burien needed a place with big hearty sandwiches that also served fish and chips (here again the Pig/Fish theme) but somewhere that offered high value, authentic food. The hot sandwiches include Philly Cheesesteak, BBQ Pulled Pork, Hot Pastrami on rye, BLT, Italian Melt, Hot Cajun Chicken and a mouth watering Grilled Cheese. The cold sandwiches PigFish offers come in a selection of meats, cheeses and toppings and yes, there's a Veggie sandwich too. Burgers are available including the Classic, Cheeseburger, a Fajita Burger and a Veggie Burger too. The fish selections are Fish & Chips (with daily hand cut french fries), Fish Tacos, and a Fish Sandwich. If salad is more to your liking Pigfish offers a Steak Salad, a Grilled Chicken Salad and House Salad. Soups are on the menu and there are kids only menu items too. You know how kids sometimes can be picky eaters? Pigfish offers four different ways they can order Pasta.. including just plain. There's beer and wine available (including Rainier and Roger's Pilsner on tap), Soda, Apple Juice and Milk. Victoria comes from a healthcare background and said they wanted to open a restaurant "for our kids" which means this is a very family friendly place. It can only seat 30 people but does offer seating outside on the deck in back on sunny days. On weekends they will offer brunch starting at 10am on Sundays offering Crab Benedict, Bacon Eg and Cheese sandwiches, a Veggie Omelette, a PigFish Breakfast Burrito, Enchilada Verde and eggs any style with bacon or sausage. Everything comes with house potatoes. All items are $16 and under. The regular menu is priced at $14 and under. The Grand Opening is set for April 26 at 4pm when Discover Burien will be on hand to perform the ribbon cutting. PigFish Cafe is open Tuesday through Sunday from 11am to 8:30pm. You can order To-Go by calling 206-246-5204. Mario Reyes and Victoria Love inside the PigFish Cafe. Can't wait to try it and support your new business!